Originally introduced in 1903 by the French magazine L’Auto in an effort to sell more magazine subscriptions, the Tour de France created the most sensational, most grueling cycling race ever, covering 3,500 kilometers in the span of 20 days during the peak of summer. The dedication and determination of the riders draw thousands of cycling fans from around the world every year as riders make their way across France – if you’re interested in joining the crowd this summer, Jet Charter Europe can take care of your private flight to the Tour de France! Around 20 teams enter the Tour each year, broken down into groups of 9 riders, and there are three different classifications of stages during the race: Flat stages, Time Trials and Mountain Stages. This year’s running of the Tour will not feature any team time trials, prologue time trials or cobbled stages, meaning the race sets up well for the strongest climbers. Here’s a few quick tips to help you enjoy the race from the sidelines before your private flight. Competitors in the Tour de France ride in a group of cyclists referred to as the “peloton”. Traveling an average of 25 – 27 MPH, this group rarely breaks up during the flat stages, where the entire peloton will pass by within about 15 seconds. If you’re looking to catch more than a light breeze from a large group of passing cyclists, the time trial stages and grueling mountain stages are your best bets. During the Time Trial stages, riders are separated by a handful of minutes each. Individual Time Trials take place during the competition, allowing spectators to every cyclist as they pass, or every group during team stages. The Tour exits Mont Ventoux this year by heading into the Bourg-Saint-Andéol – La Caverne du Pont-d’Arc stage, a 37km time trial consisting of over 900km of climbing. The Tour de France visits the Alps a little early this year with a challenging stage to Culoz and a double climb of the Grand Colombier on stage 14. A decisive mountain stage begins on stage 18, complete with a new finish along the Emosson dam following the Gueulaz climb at an altitude of 1960m. The following list contains the most popular airports for private flights to the Tour de France. Choose from private jets such as a Citation, Hawker, Lear, Falcon, Challenger, Gulfstream or Global Express. We also have access to VIP airliners, Boeing Business Jets and Jumbo Jets. Why Fly Private to the Tour de France? 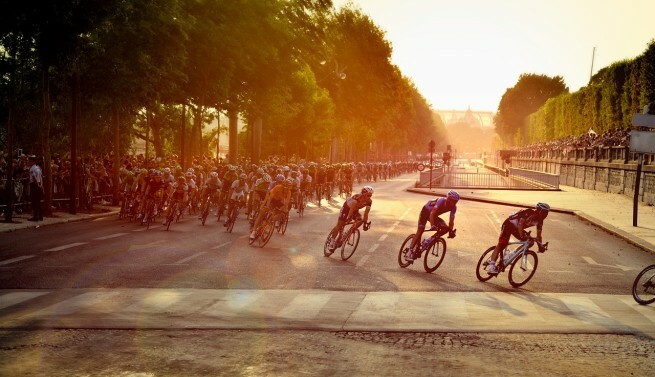 Jet Charter Europe can help you put together your own multi-leg tour of the Tour de France! We can arrange your private flight to your preferred destination within France, with ground transportation awaiting your arrival. We can also book your private flight to bring you to multiple stages of the Tour de France, including the Grand Départ from Mont-Saint-Michel on July 2nd, to the grand finale down the Champs-Élysées on July 24th. When you book a private charter flight, you’ll enjoy increased efficiency, flexibility, comfort, privacy and peace of mind compared to commercial flights. Skip the long baggage lines and time-consuming security checkpoints and board your private jet directly – with an average wait time of 5-10 minutes, you’ll be up and away quickly. Private chartered aircraft also have the ability to land at over ten times the airports compared to commercial flights, allowing you to land closer to your destination. Request a Quote or give us a call at 1-888-987-5387 to speak with one of our Jet Charter Europe representatives to book your private flight to the next running of the Tour de France!